We’d love your help. 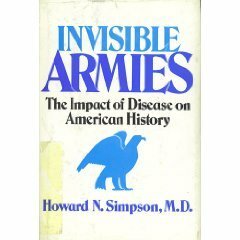 Let us know what’s wrong with this preview of Invisible Armies by Howard N. Simpson. To ask other readers questions about Invisible Armies, please sign up. This book isn't the newest, having been published in 1980. So some of the novelty o By now, we take for granted that disease was important, but the categorical way that Simpson documents hundreds of moments where disease played a deciding role in critical outcomes was shocking. Many of the stories were already familiar to me, but having all of them stringed together in a single 500 year narrative lends an impressive weight to the effects of micro-organisms in the development of the modern world.